Michigan, mid-fifties. Four of the most important and beautiful automobiles ever built. In the foreground, a Bill Burke-Raymond Loewy Studebaker Starliner hardtop coupe. Midground gives us the first hardtop Thunderbird. In the garage, a 160 horsepower V-8 Lincoln, the car that was winning the Mexican road races. To its left, a Packard Patrician which, along with the Studebaker, were the first manufacturers to offer automatic transmissions that locked up at driving speeds, a standard practice today. 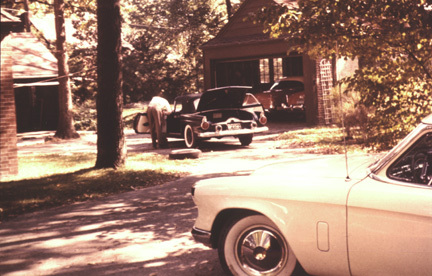 The neighbor to this quartet of cars was Stuart Wilson, owner of Stuart Wilson Ford, the largest Ford dealer in the world. Location, Highland Drive, Dearborn. His dealership on Michigan Avenue, about two miles away. Stuart's sons, Stuart and Don, raced power boats on the Detroit River and in Florida.